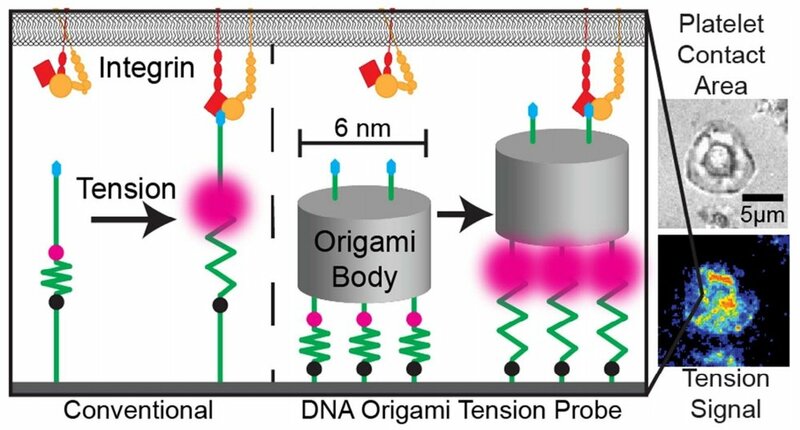 "Programmable Multivalent DNA-origami Tension Probes for Reporting Cellular Traction Forces"
"Light-Responsive Polymer Particles as Force Clamps for the Mechanical Unfolding of Target Molecules"
"Molecular Tension Probes to Investigate the Mechanopharmacology of Single Cells: A Step Towards Personalized Mechano-medicine"
"Mapping the 3D Orientation of Piconewton Integrin Traction Forces"
"Platelet integrins exhibit anisotropic mechanosensing and harness pN forces to mediate platelet aggregation"
"Site-Selective RNA Splicing Nanozyme: DNAzyme and RtcB Conjugates on a Gold Nanoparticle"
"Molecular Tension Probes for Imaging Forces at the Cell Surface"
"Supported Lipid Bilayer Platforms to Probe Cell Mechanobiology"
Konen, J.; Summerbell, E.; Dwivedi, B.; Galior, K.; Hou, Y.; Rusnak, L.; Chen, A.; Saltz, J; Zhou, W.; Boise, L.; Vertino, P.; Cooper, L.; Salaita, K.; Kowalski, J.; Marcus, A. Proceedings of the National Academy of Sciences, vol. 113 no. 20, 5610–5615. 2016. Angewandte Chemie International Edition, 55(18), 5488-5492 2016. Nano Letters vol. 16 (7), 4552–4559 2016. Somasuntharam, I.; Yehl, K.; Carroll, S.; Maxwell, J.; Martinez, M.; Pao-Lin Che; Brown, B.; Salaita K.
Nature Methods, 13, 143–146, 2016. Nature Nanotechnology, 11, 184–190 2016. Nature Communications, 6, 8307, 2015. Nano Letters, 16 (1), pp 341–348 2015. Galior, Kornelia; Liu, Yang; Yehl, Kevin; Vivek, Skanda, Salaita, K.
Molecular and Cellular Biology, in press, 2015. Nature Communications, 5, 5167, 2014. Zhang, Y.; Ge, C.; Zhu, C.; Salaita, K.
[SI movie 1] [SI movie 2] [SI movie 3] [SI movie 4]. Nano Letters, 14(10), 5539-5546, 2014. Biophysical Journal, 106(7), 1436-1446, 2014. [SI movie 1] [SI movie 2]. Journal of the American Chemical Society, 136(11), 4300-4308, 2014. Jiang, T.; Xu, C.; Liu, Y.; Liu, Z.; Wall S. J.; Zuo, X.; Lian, T.; Salaita, K.; Ni, C.; Pochan, D.; Conticello, V., P.
Journal of the American Chemical Society, 136(5), 1992–1999, 2014. Boopathy, A. V.; Che, P. L.; Somasuntharam I., Fiore V. F.; Cabigas, E. B.; Ban, K.; Brown M. E.; Narui, Y.; Barker T. H.; Yoon, Y.; Salaita, K.; García, A. J.; Davis, M. E.
Biophysical Journal, 105(12), 2655-2665, 2013. Journal of the American Chemical Society, 135(14), 5320–5323, 2013. Liu, Y.; Yehl, K.; Narui, Y.; Salaita, K.
Integrative Biology, 5, 659-668, 2013. Stabley, D.; Retterer, S.; Marshall, S.; Salaita, K.
Nature Methods, 9, 64-67, 2012. Stabley, D.; Schumacher, C.; Marshall, S.; Salaita, K.
ACS Nano, 6(10), 9150–9157, 2012. Yehl, K.; Joshi, J.P.; Greene, B.L. ; Dyer, R. B.; Nahta, R.; Salaita, K.
Journal of Chemical Education, 89(12), 1547–1550, 2012. Dip-pen Nanolithography of Optically Transparent Cationic Polymers to Manipulate Spatial Organization of Proteolipid Membranes"
Chemical Science, 3, 794-799, 2012. Journal of Biological Chemistry, 286, 31003-31013, 2011. Laroui, H.; Yan, Y.; Narui, Y.; Ingersoll, S. A.; Ayyadurai, S.; Charania, M. A.; Zhou, F.; Salaita, K. ; Sitaraman, S.V. ; Merlin, D.
Physiol. Gastrointest. Liver. Physiol., 300(3), G371-G383, 2011. Laroui, H.; Wilson, D.S. ; Dalmasso G.; Salaita, K.; Murthy, N.; Sitaraman, S.V. ; Merlin, D.; Am. J. Nature Protocols, 6 , 523-539, 2011. Communicative & Integrative Biology, 3(5), 454-457, 2010. Nanolithography,Scanning, 32 (1); 9-14, 2010. Nature Biotechnology, 26(7); 825-830, 2008. Nature Nanotechnology, 2; 145-155, 2007. Nano Lett, , (6)11; 2493-2498, 2006. Angew. Chem. Int. Edit., 45(43); 7220-7223. (Cover Article), 2006. J. Phys. Chem. B., 110(37); 18151-18153 ,2006. Khoshbin, M. S.; Ovchinnikov, M. V., Salaita, K., Mirkin, C. A., Stern, C. L., Zakharov, L. N. Rheingold, A. L.;. Wiley-VCH, Weinheim, Germany, Chapter 13, 235-262, 2007. Lee, S. W.; Oh, B. K.; Sanedrin, R. G.; Salaita, K.; Mirkin, C. A.
Nanolithography. Adv. Mat. 2006, 18, 1133-1136. Nanolithography, Small, 1(10); 940-945, 2005. Salaita, K.; Lee, S.-W.; Wang, X.; Huang, L.; Dellinger, T. M.; Liu, C.; Mirkin, C. A.
J. Am. Chem. Soc, 127(32); 11283-11287, 2005. Salaita,K. ; Amarnath, A.; Maspoch, D.; Higgins, T. B.; Mirkin, C. A.
Angew. Chem. Int. Edit. 44(37); 6013-6015, 2005. Vega, R. A.; Maspoch D.; Salaita, K.; Mirkin C. A.
Liu, X.; Zhang, Y.; Goswami, D. K.; Okasinski, J. S.; Salaita, K.; Sun, P.; Bedzyk, M. B.; Mirkin, C. A.
J. Am. Chem. Soc., 126(50); 16653-16658, 2004.
esper, B. J.; Salaita K.; Zong, Z.; Mirkin, C. A.; Barrett, A. G.; Hoffman, B. M.
J. Phys. Chem. B. 108(40); 15543-15551, 2004. Xu, X.-H. N.; Huang, S.; Brownlow, W.; Salaita, K.; Jeffers, R. B. 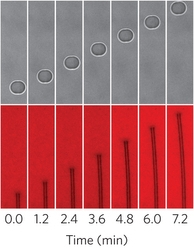 A Massively Parallel Electrochemical Approach to the Miniaturization of Organic Micro- and Nanostructures on Surfaces. Zhang, Y. *;Salaita, K.*; Lim. J.-H.; Lee, K.-B. ; Mirkin, C. A.
Zhang, Y.; Salaita, K.; Lim, J.-H.; Mirkin, C. A.